Thousands of years ago, Abraham raised a knife over his first-born son. The boy, trembling before his impending sacrifice, was spared when God decided He had witnessed loyalty enough. As Abe’s blade hovered high before the plunge, the Divine Hand traded the innocent boy for a farm animal, and so sheep’s blood was spilled FOR THE LORD. Muslims today celebrate Abraham’s sacrifice during the festival of Eid al-Adha, also known as “Feast of the Sacrifice” or “Kurban.” Eid al-Adha praises the solemnity with which Abraham bore his faith and his blade. Every October, communities everywhere join in demonstrations of prayer and slaughter. 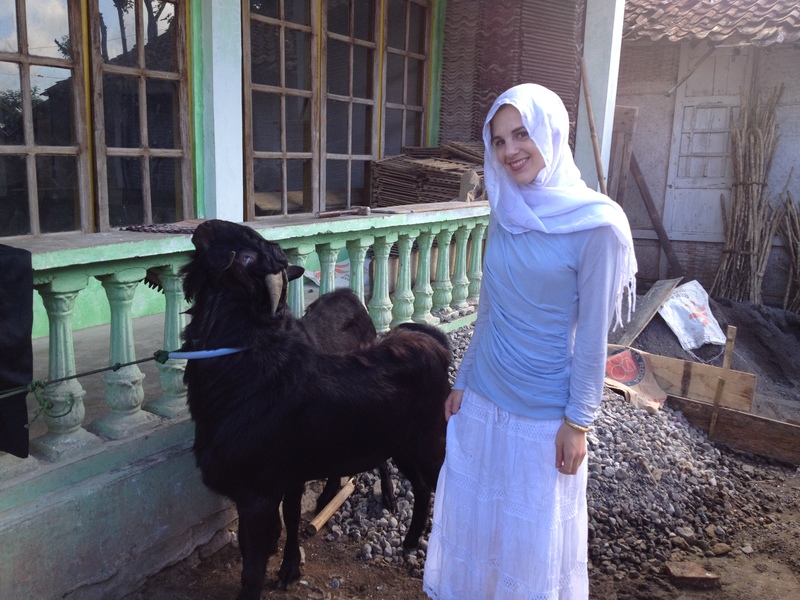 For this year’s celebration of Eid al-Adha, I went to the Javanese village of Magelang, where a middle-aged Muslim couple welcomed me into a home overlooking hills of unpicked rice. After serving a cup of milk coffee, the couple asked me about my origins. I learned that for over countless generations the couple’s extended family lived and died within a few hundred kilometers of where we sat. I should feel at home, they said. 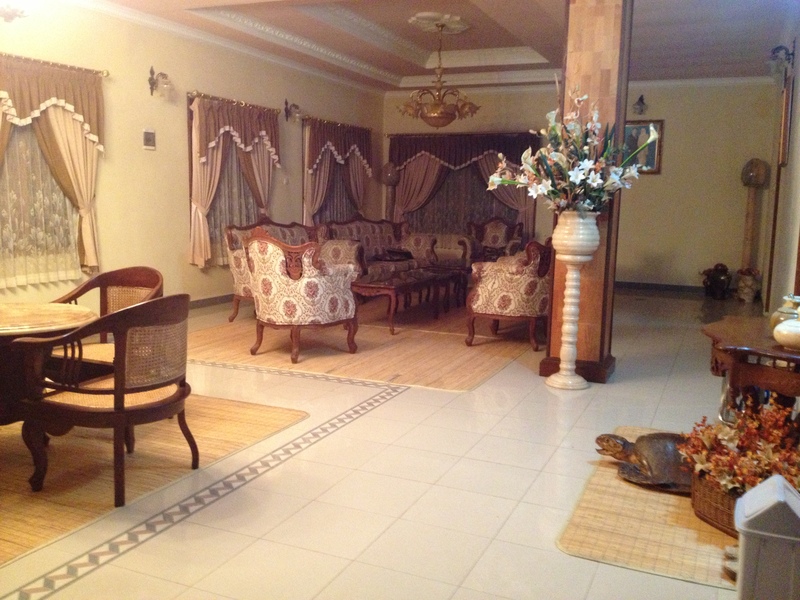 Out of hospitality, or perhaps unwillingness to host an unveiled woman near unmarried men, the couple offered a bed in their brother’s palatial home: unoccupied since that part of the family moved to Malaysia. The “villa” as they called it, towered around the corner beside the village mosque. Mid-evening, as I brushed my hair in front of an ornamented mirror, the electricity failed me. In the blackness alone, I was haunted by piety left behind by the absent home owners: a ghost of predatory, secular-related guilt that pursued me in the bedroom from the main hall, where I knew there was a film-noir-style portrait of the lady of the house staring out beneath a stark black veil. My reservoir of sin had been detected. I was convinced I would die. Instead I woke up at 5:30 in the morning and, shortly thereafter, was taken to the local mosque. I was accompanied by the host-couple’s daughter: a charismatic law student of 23. She taught me how to wear a veil. Because she was menstruating, she was not permitted to attend the mosque service, so the two of us sat beside her grandparents’ grave in a courtyard next to the mosque and listened to the Imam’s voice chanting from the loudspeakers. Beneath the mosque’s outer dome, the non-menstruating women closed their eyes and swayed. After the conclusion of the official service, my host-sister and I were allowed to enter the mosque. Removing my shoes, I knelt beside the women who lingered to worship. Over the speakers the Imam sang a hymn and the worshippers held up their hands in a cup-like gesture, as if to collect something precious. I closed my eyes and tried to join them. As usual, I couldn’t raise my thoughts above Earth. To my best ability I attempted to shove aside my skepticism and pride and, in doing so, was able to meditate to the chants of the surrounding women. They sang divine praise in soothing vibrations. It was enough. 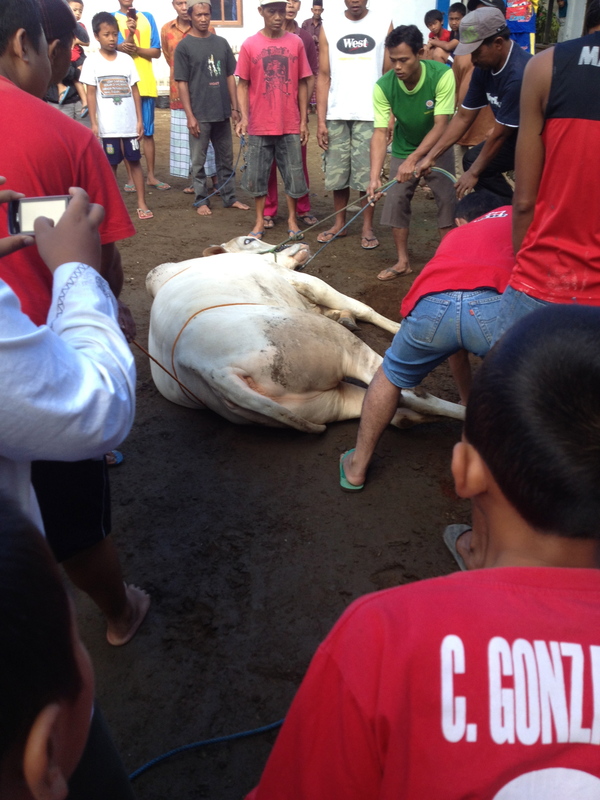 Later, the villagers congregated behind the mosque to watch the “Kurban” or slaughter ceremony. Upon entering the village clearing, I saw that a white cow, about the size of a car, had been roped beside a sizeable dirt hole. Four men were required to bring down the beast. The cow struggled. Young men of the village rushed in from all sides to grab the animal’s limbs and stop the writhing. Finally accepting defeat, the cow lay still for the knife. Next to the beast, the Imam stood with a long blade in his right hand. Lifting his head up to the sky, the Imam bellowed the name of God: “Allahu Akbar.” God is the greatest. The voices of the congregants rose to join the cry. Many of the women and children held hands, and soon the whole community sang to God and His unlucky cow. Before the knife was laid upon the animal, I stepped close to bid a private farewell. Looking at the cow’s eyes, the cow to my surprise did not seem far from peace. I wondered if it knew anything of the pain it would endure, or if — like a baby in the warm arms of a stranger — the cow found comfort in the hands of many men cupping its body as it lay at mercy. Perhaps the sturdiness of the animal’s captive state was just gentle enough for it to surrender and let go. I wondered how many living things, humans or beasts, were given the privilege of dying under the touch of so many warm-blooded creatures. The actual slaughter, of course, was difficult to watch. I had never witnessed the death of an animal so large, and especially (forgive me) with a neck so thick. I stood at a distance so the spray of blood wouldn’t reach my white skirt, and for comfort I clutched the arm of my host-sister who, upon the first spatters of blood, gently took my head and brought it to rest upon her shoulder. Gaze now pointed slightly below the gruesome scene, I looked at the animal’s legs, which were elegantly crossed and shuddering. As the cow’s movements slowed to a halt, the village men kept their palms firmly on the hide, waiting for the pain of their victim to slip into God’s more merciful hands. Sheep were brought forth by families who could afford the expense. The animals were hung from a pole, where prayers were administered and knives swiped. The children gathered and waved goodbye to the sheep waiting to die. Some little boys approached the sheep that were already dead and, with a crude and morbid bravery, grabbed ahold of the horns. With innocence the little boys pretended to “steer” the fallen sheep like motorbikes, and — despite the disconcerting disregard for pools of blood beneath their feet — such play made it admittedly easy for me to forget about death, or at least quell the concept as an afterthought. As the morning wore on, the Imam’s white t-shirt became increasingly red. Between each slaughter, the Imam descended a flight of steps into the mosque washroom to splash water on himself and to sharpen his knife. Upon each request to bless another sacrifice, the Imam ascended the steps like a gladiator. 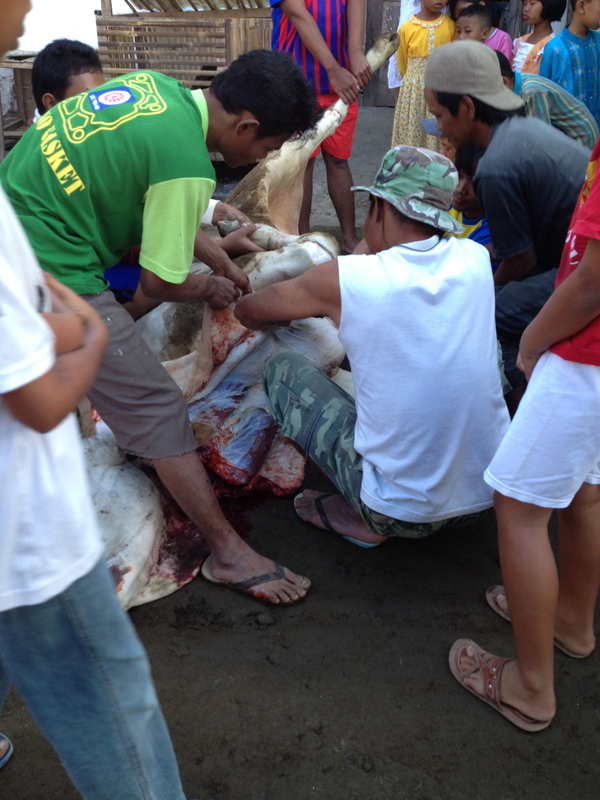 After the death of all animal offerings, the cow and sheep were skinned. I watched the skinning process with reluctant fascination. 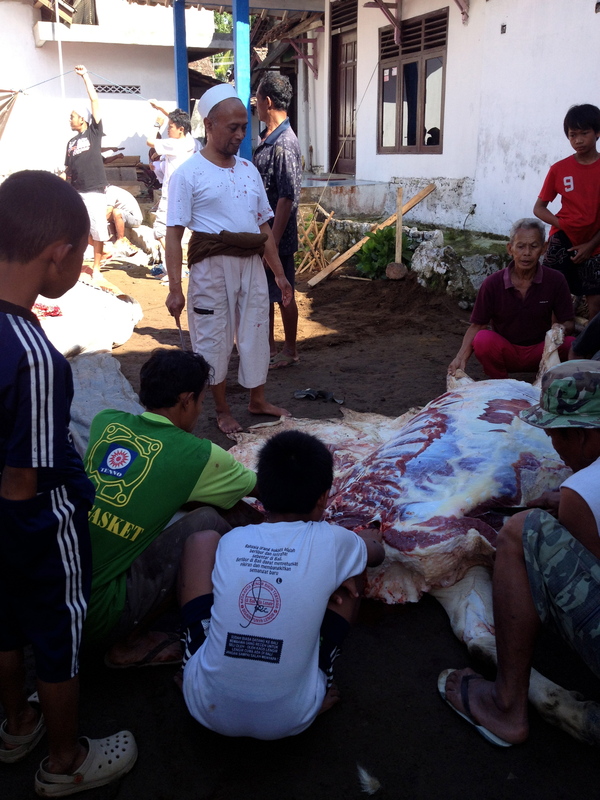 At last the meat was evenly distributed in plastic bags to the villagers without regard for financial status or religious affiliation. Beside me older men gossiped and smiled amongst themselves. Winking at my host mother, they suggested the prospect of marrying me off to a nice Muslim man from the village. In the morning before leaving Magelang, my host father sat beside me at the coffee table. He encouraged me to bring my parents for a visit to his village. “We are not terrorists,” he said, smiling. I wondered what it meant to “feel at home” in a place where people unified under a common religion with which none of one’s loved ones identified. And I wondered at how a village so protective of its modesty might approach other members of my culture who found the greatest fulfillment in being — in every way — unveiled. But then I observed my host-father’s earnest smile, which was in no way burdened by my partially exposed skin, bare head of hair, or even my lack of religious affiliation (which I had admitted upon my first night of arrival). His smile reflected an openness I envied: an openness to accept anyone outside his family as his own blood, to respect all individuals regardless of what spiritual plane they were bound for. It was this realization that made me wonder if I could ever bring myself to return to Magelang: not because I didn’t feel I could belong, but because I didn’t feel worthy of kindness suitable for someone far purer of heart. The interior of the mosque after the conclusion of holiday services. Here, the the village men took their breakfast. I believe you have an amazingly open heart.